A second slice of jazz prog sludge heaviness, but taken this time to a new level of structural and textural sophistication with the addition of fantastic vocals from Elaine di Falco. Terrific album from this heavy zeuhl/brutal prog, project, led by bassist James Huggett. This has all the things that made their first album a clear winner with one additional secret weapon: Elaine di Falco, the magnificent singer of Hughscore, who appears on the entire album and adds a striking, cool touch to what is otherwise a blazing and white hot album. Highly recommended. Really! A couple years back, we raved about a disc called The Dematerialized Passenger, the first album from this unique band (or perhaps we should say project), remember? 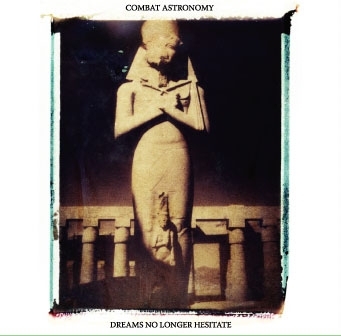 In case you don't, here's the deal: Combat Astronomy are a USA/UK collaboration, creating a crushing industrial/jazz/prog hybrid. Imagine Godflesh with a free improv horn section, saxophones squealing amidst the metallic riffage. Or Scorn taking a skronked-out stab at chamber music. Like their earlier release, this new Combat Astronomy opus is again laced with punishing, rigid drummachine beats, along with heavy, uber-low-end fretless bass shaking each song with doomic distortion. Which establishes an absurdly heavy context for sax, clarinet, flute and bassoon to freak out organically, like wild weeds creeping through cracks in giant slabs of concrete, on the floor of an abandoned factory somewhere. Three years after the ground breaking and critically acclaimed "The Dematerialised Passenger", transatlantic progressive jazz outfit Combat Astronomy return with \'Dreams No Longer Hesitate\', their third full length album. An epic disc of inspired and multidimensional modern music, \'Dreams No Longer Hesitate\' builds on influences such as the avant prog-rock of Magma and space jazz of Sun Ra, incorporating elements of the sophisticated mathematical grind of bands like Meshuggah and Godflesh while retaining a unique and coherent voice that is entirely its own. Elaine di Falco (Caveman Shoestore/Thinking Plague) brings an intimate, ethereal and impassioned vocal presence that has a remarkable synergy with the guttural down-tuned bass guitars of Combat Astronomy lynchpin James Huggett. Di Falco\'s voice melds into breathtaking harmonies that swirl above the thunderous and serpentine rhythm section of Martin Archer, Mick Beck and Mike Ward. Stars of theBritish underground improv/jazz scene, Archer, Beck and Ward return with searing, pin-sharp horn work that varies from baying ensemble insanity to delicate, exotic textures.